Colorado blue spruce trees typically reach a height of 30'-60' and spread out 10'-20'. Their silvery-blue needles are prickly to the touch and aromatic. The pyramidal shape of Colorado blue spruce trees makes them a classic choice for Christmas. 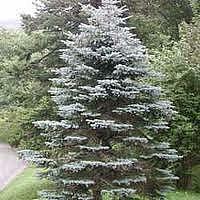 Colorado blue spruce trees don't need to be pruned, but they can be pruned if you wish to promote denser foliage. Prune off half of the fresh growth on each candle (i.e., growing tip) in spring. Plant in full sun to partial sun in a location with moist, fertile soil. Can be planted in rows to form windbreaks. But they're equally effective as specimen trees. Colorado blue spruce trees are valuable in deer country, as their prickly texture and strong aroma render them conveniently deer-resistant. In the snowy North, where landscapes can look barren in winter, evergreens such as Colorado blue spruce trees can provide much-needed winter interest. Speaking of winter, a growing trend is to buy them live (in containers) for indoor Christmas decorating, then plant them outside as landscape plants after the holiday. Dig the hole in the ground for planting well before December, so you won't have to dig through frozen dirt. Bring the excavated dirt inside, to keep it from freezing; you'll need to keep it loose so that you'll have workable dirt with which to fill in around the new specimen after planting it in its hole.